Just a quick question and discussion point . As i hope we all agree , there are no such thing as style specific Kata , only variations and versions of, so what style of Pinan Kata most closly resembles Itosu`s original intention before the styles of Karate developed there own. Im a Wado(ist) , and ive a few training partners who are of differant styles , and opinions , and we just wondered what the assembled masses view on this was . Well, if everyone is being "Truthful", and there is still a lot of interpretation to that, I'd say Shito-Ryu. As Itosu made Mabuni Kenwa the heir and Soke of the Itosu Ryu system when he passed away. The first issue I see, is Soke Kenzo Mabuni always insisted he taught exactly as his father did, yet we have minor differences between Shito-Ryu kata, and Shito-Kai kata taught by Soke Kenei Mabuni. With that, Soke also stated his father always taught as Itosu and Higaonna taught, yet we have differences that are well documented between the Goju-Ryu Kata from Miyagi and Shito-Ryu kata from Mabuni, and the Itosu kata from other students. We can rack it up to they taught as the honestly believe they were taught. We also have the issue of other influential masters on Shito-Ryu such as Kuniba, Hayashi, Sakagami, etc. So the question starts to get very complex. We can turn to literature, and view publications to see how things were done to some degree, but I am unaware of anything published directly by Itosu. I used to be a Wado'ist and for me i found that the position of the hands in the Shuto Uke's were more of a training issue than actual application. I've also read somewhere that Ohtsuka Sensei was first taught the Pinans/Heians from Funakoshi Sensei then was retaught them from Itosu Sensei. For me the Pinans are Training Kata for Colleges and Schools BUT I know there are some Karateka that have some excellent Appliactions to these. If were talking about what external forms, not applications, I would say Funakoshi's style that he taught prior to his son changing many things into what we would call, "traditional Shotokan." In his photos, hes never in deep stances of todays shotokan, as this picture demonstrates. That question is impossible to answer. We simply don't know what Itosus Pinan-Gata looked like. So no comparison can be made. I don't know about that. Mabuni could have changed the Pinan-Gata before teaching them to his sons. Maybe he taught his sons the Pinans differently for whatever reasons. Mabuni Kenzo was nearly 10 years younger than his brother Kenei. So Kenzos version could be the furthermore developed one in comparison to Keneis version. When comparing the Shito Pinan against the Shotokan Pinan from 1922 there are differences. Maybe Funakoshi learned an earlier version of the Pinan than Mabuni or vice versa. Maybe Funakoshi also changed them like Mabuni did perhaps. Who knows. You can also compare them to Chibana Choshins Pinans. He was also a direct student of Itosu. Again we have differences. So unless someone finds a document were Itosu is showing his Pinan-Gata to the world the above question can not be finally answered. To claim otherwise is politics in my eyes advertising a certain organisation of a certain instructor. I am talking about the "Look at us! We practise the most authentic style of all others!" kind of advertising. No offense Dale. I think you summed up what I was trying to say in my last sentence. The way to look at this is not unlike the evolution tree of life. Human beings did not evolve from apes, but at some point in the last 7 million years there was a common ancestor from which both modern species (African Apes and Humans) evolved. This is true for all modern species alive today, it is very unlikely to find a modern species having evolved from another non-extinct species (accepting bacteria) - this is also true for living fossils etc. Anyway as an analogy I think this is true for modern day kata - especially considering the difficulty of recording and codifying a standard that would be resistant to change (no You tube in 18th/19th Century Okinawa). As kata is passed from teacher to student by essentially a non-precise word of mouth, foot and fist...it "develops" and like a tall-story it changes with each "telling". So when looking at the Pinans it is likely to be wrong to say that the Wado and Shotokan versions were developed from the shito Ryu versions. What would have happened is that in ALL cases the modern versions have shared a common ancestor - we can assume with some degree of confidence that it was Itosu's, lets call it, first draft of the Pinans. Now different students of Itosu would have learnt the latest versions of the Pinan Series at the time of their instruction by Itosu ( we can assume that he revised and honed his kata - as it is something an innovator would naturally do) and it is also likely that there would have been variation between older and more recent "drafts" of Itosu's kata. Over time through each generation of the teaching/Learning cycle, the varieties of Pinan Kata's would change and develop. So for all of the pinan varieties we see today, each has evolved over the same duration (and it is very important to realise this) , . So whether you look at Shito Ryu or Shotokan - the final version of the Pinan's in each case has evolved for the same length of time.......and each should contain (assuming an equal rate of change over time) the same degree of variation, all be it of different parts of the kata form. Therefore you cannot assume that what you see in Shito-Ryu is the defacto original form as without mapping all the modern versions of the Pinan series to a "tree of Kata" and then through comparison understanding where/when the key changes occurred - you cannot know what was changed by subsequent instructors within any of the different varieties of modern day Pinan katas. As others have said, we don’t know because we don’t know what the “originals” were like in order to make a comparison. I’d also like to add that there may well not have been one definitive “original”. It is entirely possible – and personally I think likely – that Itosu taught a few differing versions during his process of developing them. So what would be the “original”: the first version he ever taught, or the final version he settled on? It’s also possible that he taught different versions to different students. The desire for unrelenting uniformity was not present in the past as it is today. We also need to ask the question if there is any inherent value in the notion of something being original; or closet to the original. During karate’s evolution to being a lot more “art” and a lot less “martial”, we see the strong introduction of what I like to call “artificial success criteria”. What I mean is that things are deemed “good” or otherwise when judged against standards which have nothing to do with actual function. This would include things like the adherence to the dictates of a given style, aesthetics, competition rules etc. It’s the move away from something being good because it is efficient and functional to something being good because “that’s the way it’s supposed to be”. Under this way of viewing things, any variation – even variation which can be shown to not diminish effectiveness in anyway, be more effective for the individual, or even more effective over all – is deemed wrong because, “that’s not the way it is done”. The desire to be close to the original is essentially a desire to be “variation free” and hence stems from this “artificial success criteria” which is so thoroughly ingrained in karate culture. Variation is not inherently bad. So long any school can explain why they do the kata the way they do, and are content that that is empirically the most effective way for them – or at the very least, can demonstrate that their variations in no way diminish efficiency or effectiveness – then that’s more than good enough in my view. We’d still be in the stone age if we had a similar approach to technology i.e. what is valued is the ability to recreate what already exists; exactly as it exists. Progress is only made when change is permitted and, crucially, that change is tested for validity. Functionality should be the only true measure of value. I think it’s a great thing that all the variations on these kata exist. Of all the main variations I have came across, I have found none wanting when viewed from the context of the style they belong to. They are all good and functional; regardless of which ones were closest to the original. I don’t know if I’d use the word “truthful” because we simply have no information to determine what is the truth or not. No record of how Itosu himself performed those kata exists. However, if that record did turn up, and I had to bet on it before seeing it, I’d bet that the older Shito-Ryu versions (i.e. as Mabuni himself is photographed doing them) would be the closest. No unequivocal facts to base that on, just the observation that we can see the changes in Shotokan in the literary record (i.e. compare early pictures of Funakoshi with how the kata are performed in modern Shotokan). The Wado versions draw influences from both Mabuni and Funakoshi because Otsuka was taught the kata by both men (and Naihanchi by Motobu). The modern Shito-Ryu ones seem pretty consistent with what Mabuni shows in his books (leaving aside the various “association variations”) so I’d bet on those if pushed. However, as I said earlier, there probably never was a “definitive original”, and even if there was, being close to it has no inherent value in itself. Also, the Pinan kata as we see Mabuni doing then in photographs are not radically different to the Wado ones (they are close to being totally identical in some cases i.e. Pinan Nidan), or the older Shotokan ones. They are all very close and essentially the same thing. Otsuka never studied directly with Itosu; so I think you must be thinking of Mabuni. I don’t think we can say that Chinto is a “super kata” that contains everything found in all others. I’m of the view that all kata are pretty complete in and of themselves; but they do contain differing information and differing approaches. Chinto is a good kata, but I think it’s not tenable to present it as the “ultimate kata” that teaches everything all the others have to offer. I was writing my post as you posted yours. I think you’ve nicely summed up what I was trying to say about there never being one “original” in the above paragraph. Absolutely, but what I think people often get confused with is that even when the originator of a Kata is known he certainly developed and honed his skills and his Kata, like you wrote in your post. So an early version is not necessarily a better or the best version. So when Itosu taught the Pinan-Gata for the first time in 1904 until his passing in 1915 he could literally have taught it a little bit differently every year. And now the confusion starts. So 9 former students could hava learned 9 slightly different versions of the Pinan and which of those 9 versions is the original Itosu version? All of them. Mhhhh. Exactly. People should appreciate all the different versions and try to figure out what those differences could mean. That's what I like so much about Iains explanations about the differences. My example for this kind of evolution is a comparison of the beginning of the Matsumura no Passai and the Itosu no Passai. I find the Itosu no Passai has the better solution for that. I think Iain is dead on here. I've seen a lot of this type of debate over the years where people will say your not doing the kata exactly as Ohtuska Sensei taught or Mabuni taught and quite frankly it drives me nuts. Most of these people don't even realize their own system has changed and evolved over the years so how can they claim that they are practicing a pure kata or orginal version. I practice Wado Kai and not Wado Ryu and in the Wado community I seem to be looked down upon or less than. For me it's more important to understand the principles and be able to apply kata techniques realistically over slight variations in kata form. Basically to me I just practice karate ! I also don't think it was uncommon that old masters or even modern day masters would teach slight variations of katas to their students. I know our Sensei did that with us. Sometimes it was something he noticed about your body type or style that he was trying to accomdate. I think the closest to Itosu Pinan kata would be the Kobayashi of Chibanna Sensei and thats readily avalaible to view. Shito Ryu for me 'developed' more with wider influences. Not a bad thing at all of course. |It's perfectly possible to be a good karateka without using the Pinan, but the Pinan do seem to me to have techniques and combinations I've not found in other forms. Are you saying that Kanku Dai is the most important kata for Shotokaners because all other Kata have movements in them which are also in Kanku Dai? What about all the movements that aren't in Kanku Dai? What about the obvious strong influence of the Tomari Te forms on the Pinans as an example? I think Kanku Dai is a perfectly serviceable form, but I'd chose the 5 Pinan over it any day as I think their additions that aren't in Kanku Dai are far more important than their omissions. I’ve done a web search but can’t find anything. Could you point me in the right direction of any videos, etc so I can add them to the tread? Many thanks for your comments and answers , ive had a discusion this evening in my dojo and the majority opinion of my training partners was that the current version of the katas is the original and most important one one . In other words it doesnt really matter , and whatever version you practice , thats the version you practise ! . It must therefore suit you and your group . I disagree with Black Tiger , with regard to Chinto . It is a servicable kata , but i also think the pinans are a complete fighting system in there own right . Many many thanks again for all your thoughts , ive always found kata fasinating , and with the assembled quite varied views within this forum , i always will . Im doing a little artical on the pinan katas for my own enjoyment , and discusiions like this add considerably to my thoughts and education . I’ve always found kata fascinating, and with the assembled quite varied views within this forum, I always will. We need to spend a little more time keeping the flame burning rather than just preserving some ashes. Too much time has passed, too many people have imposed their personal interpretations and preferences, and too many people haven't been brave enough to justify the changes they have made and simply told people that's the way they were taught it...and as long as the evolvement of kata is done for sound reason then it's fine...kata means model or template, hence variation is its natural partner. Kata should change as our nderstanding as we get older, as our knowledge of biomechanics and physiology improves, and as our purpose of training adapts. Who can honestly say they perform the same kata exactly as they did five or ten years ago. The change to shikata (lit. The way things are done) is a natural and normal occurrence within ryuha, it is just ccomplicated by maintaining a standard model with the proliferation of styles around the globe and a quite unnatural fixation on everyone wanting to do it exactly the same as everyone else instead of doing it better each time whilst keeping a strong association to the template. The youtube collections I was thinking seem to be gone, but if you can find Shidokan or Shorinkan Pinan then they should be what were looking for, I will get to it- Kyudokan as far as I can tell had a NahaTe influence and some serious hip movements 'developed', so its not so good for our purpose. Nice kata etc but not for this topic as it's the Kyudokan. Could you post some links please? You’re the only one who knows what you’re really referring to and the rest of us are not having much luck finding them. I did a search too and the kata I found looked “modern” in terms of their way of performance, “h-pattern embusen”, etc. So I doubt those are the one you are referring to either. If you could post the links it would make things a lot simpler and I’m sure I’m not alone in being keen to see the kata. Thanks! 1. Pinan Godan- This is a clip of Miyahira Katsuya performing Pinan Godan. Miyahira Sensei was a student of Chibana Chosin who was the last living student of Itosu Yasutsune. I will need to spend some proper time to do this better! But it gives an idea. The exsistance of Neko Ashi Dashi and Shiko Dachi elude IMO to a significant TomariTe influence on Itosu karate, you (IMO) can also see the forms are simplified in execution, despite it being mostly class teaching, this is inline with Itosu Sensei development of the art for the schools etc. This is a clip of Miyahira Katsuya performing Pinan Godan. Miyahira Sensei was a student of Chibana Chosin who was the last living student of Itosu Yasutsune. I’ll need to watch the others in more detail when time permits. Thanks for adding the videos Jim – I think this is a very information rich thread. Simplified in comparison to what? I note that the first karateka used kokutsudachi instead of cat stance. I believe the kobayashi ryu also use back stance, are they a Chibana lineage group as well? If so it suggests that cat stance was a late addition to itosu's karate since elder students don't do it. I believe Itosu's principal teacher was Oyadomari (no idea if that's correct spelling) of Tomari so what you say makes sense. I think what kind of Kokutsu Dachi was used came down to personal preference. 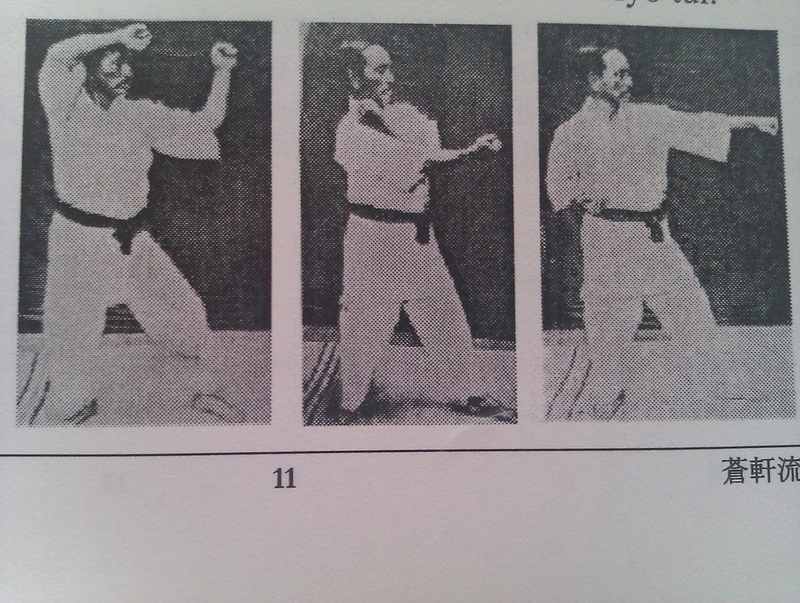 Funakoshi used the second and later the first version, Mabuni used the forth version for the Pinan If I remember right. Itosus student Hanashiro used the fourth form of Kokutsu Dachi for his Jion. The Matsumura Passai and the Itosu Passai make use of the third version. So I asume that the Cat Stance was pre Itosu. You could also take a look at chinese systems they also make use of the Cat Stance. Chibana was the founder of Shorin Ryu (alernative reading is Kobayashi Ryu). Chibana himself insisted on the Kanji as being pronounced Shorin Ryu rather than Kobayashi Ryu. There are other Kanji used to write Shorin Ryu. They are pronounced Matsubayashi Ryu and Shobayashi Ryu or Sukunai Hayashi Ryu, depends on the Kanji that are used. Chibana had several students forming their own branches of Shorin Ryu (Kobayashi). Katsuya Miyahira founded Shidokan, Nakazato Shugoro founded Shorinkan (mentioned by Jim in his post), Kyudokan was founded by Higa Yuchoku. As Jim mentioned he has also learned under Jinzato Goju Ryu, thus his accent on the hip movements. One of his students was Onaga Yoshimitsu who founded Shinjinbukan. Those four branches (Shidokan, Shorinkan, Kyudokan, Shinjinbukan) are closest to Chibanas teachings. I think the Kyudokan Pinan are representative despite the Goju influence on the hip movements. They look similar to the Pinan of Shidokan. Itosus main teachers were Nagahama from Naha and Gusukuma of Tomari. Gusukuma was close to Oyadomari and Matsumora, thus Itosu could have learned other Tomari-Gata from those men. You picked me up on that comment and rightly so, it's simplified IMO when you see repeat elements of single arm Blocking, lack of timing variation, single techniques used often etc. I believe the TuiTe element is not taught so much within these groups as a focus is more towards a specific power delivery method for striking etc- so simplified is perhaps a clumsy term I used. And hey the Pinan are meant to be simple in comparison to the classical kata, it's why they were bult! I think the simplification of the Pinan is very important. Maybe that makes them 'beginners' Kata, but to me that's also what makes them the more practical (and advanced) Kata. If I wanted to leave a legacy of my own approach I would not make a 'beginners' kata, even if I taught it to beginners. I'd make a kata that refined and distilled the lessons I had learned. Cameras at the time probably would not have been able to catch an “action shot”. In the English language translation I have the text that accompanies that picture states, “Raising the right foot first, jump high and deep along the same line as if flying and land in the posture shown”. So it would seem it is the jumping version that is been shown. Thanks Iain, I didn't have any translated version of the picture. I thought he wasn't jumping because he was facing to a side, similar to the youtube video I posted. The postures are certainly very similar, and we can see who one easily evolved into the other. Thanks for posting the video!